The necklace length is very important because it not only determines your outfit but also hints at your personality. When it comes to the nekclace type, it is important how you style it according to your face type. Last, but not least, it matters how to match your necklace with your outfit’s neckline and other jewelry. To get a general ideal about different necklaces for women and style & maintenance rules, read our comprehensive guide. Read further if you want to enhance your personal style. As you know, there are several types of necklaces. From chokers to beaded necklaces and statement pieces, you can find a wide varity on the market. However, one important category for necklaces is the necklace length. Here are all the necklace lengths. As opposed to what some people think, the collar necklace is the shortest type of necklace, shorter than the choker. It is also more elegant than a choker necklace. A collar usually has between 12 and 14 inches. It can be a single strand collar, usually metallic, or a multiple-strand collar necklace. Its necklace length makes it ideal for off-the-shoulder necklines, as well as V-neck or boat necklines. You should choose a collar for elegant occasions. For more casual ones, you can wear its brother, the choker necklace. A choker usually has between 15 and 16 inches length and, just like the collar, it can be single or multi-stranded. Because the choker necklace is in high demand nowadays, you can find multiple styles on the market. From elegant and opulent chokers, like the diamond choker, to casual ones, like the classic tattoo or leather strip choker, this type of necklace is great for many occasions. The rule of thumb is to wear your diamond, gemstone or gold chokers to elegant occasions and leave your leather strip or lace chokers for more casual situations. Another great thing about the choker necklace length is that it looks great with almost any neckline. And by almost we mean no turtlenecks. To find out more about how to style a choker necklace, read this article. This necklace length is around 17 to 19 inches and it’s very easy to accessorize. Due to its length, this type of necklace is versatile and appropriate for both formal and informal occasions. The most important rule when wearing this necklace is that it needs to be either above or below the neckline. Wearing a princess necklace length that ends exactly where your neckline begins is a big no-no. Wearing a matinee to work is a great idea. It has between 20 and 24 inches and it usually sits comfortability just below the collarbone. A matinee will always look great with a little bit of cleavage, but you can also wear it with a turtleneck. When wearing this type of necklace, the most important thing is to choose a simple top. As the name suggests it, this type of necklace is more elegant and appropriate for formal occasions. It has between 28 and 34 inches and it hangs just below your breast area. Higher necklines are ideal for the opera necklace. One type of neckline you should avoid when wearing this necklace length is the sweetheart one as it can clash with the necklace line. If you want to offer the sensation of a longer face as opposed to a round one, this is the type of necklace you should be wearing. Both lariats and rope necklace have over 45 inches in length. While a lariat is more subtle and usually metallic, rope necklaces are beaded. Depending on their style, you can choose a lariat for casual wear and a rope for more elegant occasions. But, as we said, it depends on the style of the necklace. When it comes to necklines, aim for a deep V-neckline. Avoid turtlenecks and other similar necklines when wearing these types of necklaces. For a round face shape, choose opera, rope and lariat necklaces. Avoid collars and chokers as they shorten the neckline, as well as some types of chunky necklaces. To discover how to style a chunky necklace, read this article. For an oval face shape, wear chokers, collars, and You can also wear opera necklaces, but avoid lariats and ropes because they elongate the face. For a rectangular/oblong face shape, the best necklaces to wear are collar, princess, and choker lengths. Avoid matinees as their length can clash with the shape of your face. 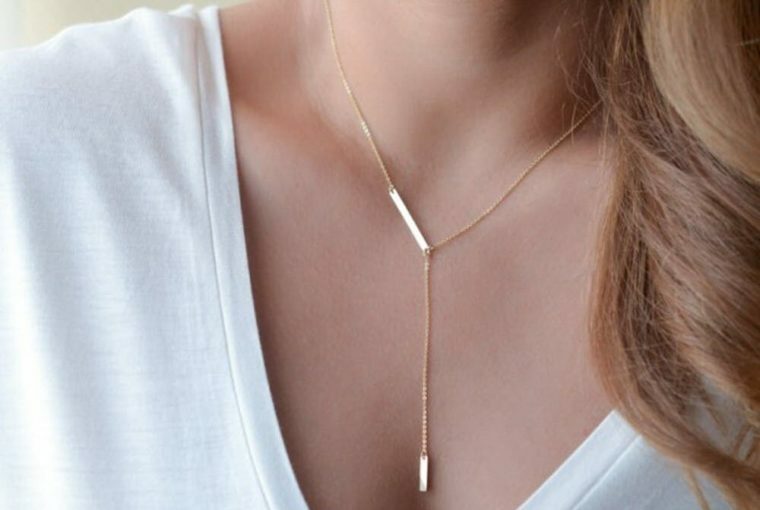 For a square face shape choose longer necklace lengths like opera, rope or lariat. As in the case of the round face shape, avoid collars, chokers and princess necklaces. For a heart face shape, shorter necklaces are ideal. Wear collars, chokers and princess necklaces. You can also wear longer styles like the lariat or opera, but make sure to pair them with a short necklace as well to maintain the balance. For a diamond face shape opera, matinees but also chokers are ideal. Avoid princess necklaces and collars. If you want to wear a lariat or a rope choose pearls as they balance sharp angles nicely. As you know, an elegant necklace goes with an elegant outfit, while a chunky one goes with casual clothes. But this is not everything. In fact, the most important thing when wearing a necklace is how you match it with your outfit’s neckline. A deep V neckline goes great with a lariat or a rope-length beaded necklce. A choker, collar or even a princess-length delicate chain necklace will look gorgeous with a strapless neckline. With a halter neckline it is best not to wear a necklace. If you really want to, choose a delicate one. If you are wearing a sweetheart neckline, go for a statement collar or a beaded choker necklace. 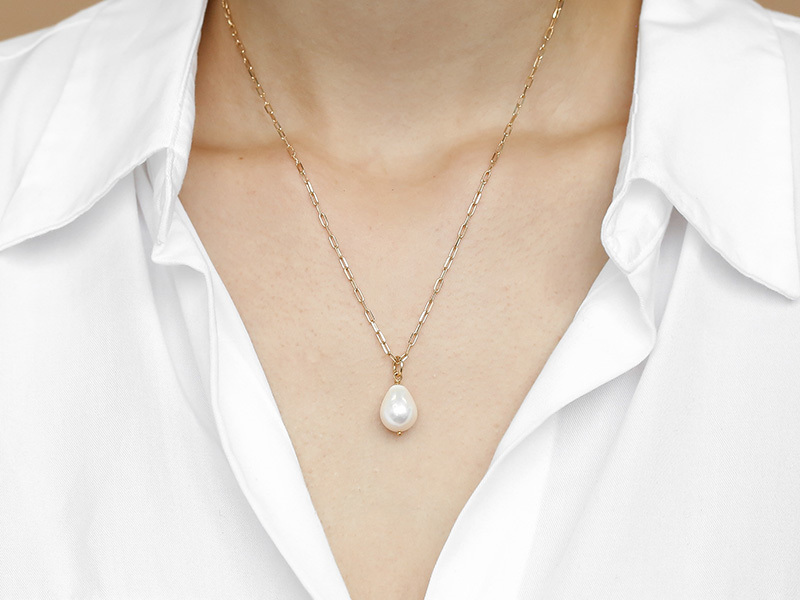 The T-shirt or jewel neckline is great for a multi-strand pearl necklace or a statement necklace. An asymmetrical neckline will look great with a delicate layered chain necklace. Avoid beads and anything round with this type of neckline. The classic bateau neckline doesn’t look well with chokers or collars, but it goes great with an opera-length beaded necklace. Of course, the necklace you choose also determines the other jewelry pieces. With a big statement or chunky necklace avoid statement earrings or even bracelets. You can wear a statement or a cocktail ring, though. If you want to wear a long necklace length, avoid drop earrings and go for clusters or studs instead. A short necklace length, on the other hand, goes great with any type of earrings. Last, but not least, don’t be afraid to combine metals, but make sure you keep a common theme. When it comes to gemstones, choose colors from the same family or two contrasting colors. To read about how to stack necklaces, click this link. Visit Ana Luisa online shop to view our premium collections of necklaces for women. You will discover unique designer pieces at fair prices. For more information about jewelry, read our other articles as well and make sure to share them with your friends.